Whether preparing for a wedding, a first date, an important job interview, or simply wanting to achieve a younger-looking and more rejuvenated complexion, women are always searching for the newest cosmetic treatment to leave their skin glowing and flawless. HydraFacial® offers just that: intense hydration and exfoliation with no downtime, discomfort, or unwanted side effects. This comfortable and soothing facial provides everything any woman could want, from smoother skin to the treatment of fine lines and wrinkles. The HydraFacial® system doesn’t simply mask skin concerns; instead, it improves the overall skin quality from the inside out. Women choosing HydraFacial® are interested in enhancing the quality and texture of their skin through intense hydration. This facial addresses common skin concerns such as fine lines and wrinkles, sun damage, hyperpigmentation, oily skin, and clogged pores. HydraFacial® can benefit every skin type, including aging, thin, ethnic, dry, or oily and congested skin. The HydraFacial® system transforms dull and tired skin into a soft and refreshed complexion. 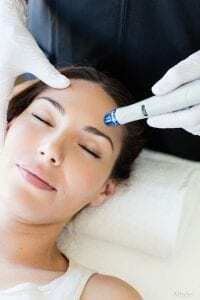 HydraFacial® uses a unique Vortex-Fusion® delivery system that sets it apart from all other facial resurfacing procedures. This technology uses a series of spiral tips that each play their own role in improving skin quality. HydraFacial® gently exfoliates and resurfaces the skin before debris and dirt are removed with a comfortable vacuum suction. Your skin is then saturated with antioxidant and peptide serums meant to hydrate, nourish, and improve your skin’s texture and quality. Additional booster serums can be added in this final step to customize your procedure. Serums are available to minimize the appearance of fine lines and wrinkles, congested pores, and hyperpigmentation. This soothing facial is performed in under 30 minutes and is sure to leave any woman feeling as refreshed and rejuvenated as they look. HydraFacial® is a comfortable and soothing facial procedure that requires no downtime. This procedure is non-invasive and non-irritating and leaves you feeling refreshed and rejuvenated. You can apply makeup and return to work and your normal activities the same day as your treatment with no worry. With HydraFacial®, there is no threat of discomfort, redness, or irritation. Embrace rejuvenated and younger-looking skin immediately following your treatment. Skin will remain beautifully hydrated for five to seven days, and with repeated treatments, concerns such as fine lines and wrinkles, sun damage, and congested pores can be remedied. Most patients repeat their HydraFacial® treatments every four to six weeks initially and then receive a touch-up facial every few months.